Applying for pair seats is possible. Applying for the same stage with 2 serial codes (from 2 tickets) at the same time is possible only via CN Play Guide. Stage Lottery results announcement / start of ticket issuing period. ※The lottery results will be sent to the email address used for CN Play Guide account registration. The results can also be viewed from 11:00 JST, at the application website or CN Play Guide website in your application history/ lottery results. ※Stage Ticket can be issued from 11:00 JST. ※Please issue your Stage Ticket at Family Mart or Seven-Eleven store. ※Stage Ticket can be issued until the day of the event. ※Please apply through CN Play Guide official website. You can apply for up to 5 programs with one ticket. For system reasons applying for only 1 stage per application is possible. If you wish to apply for 5 different programs, please repeat the application process 5 times. 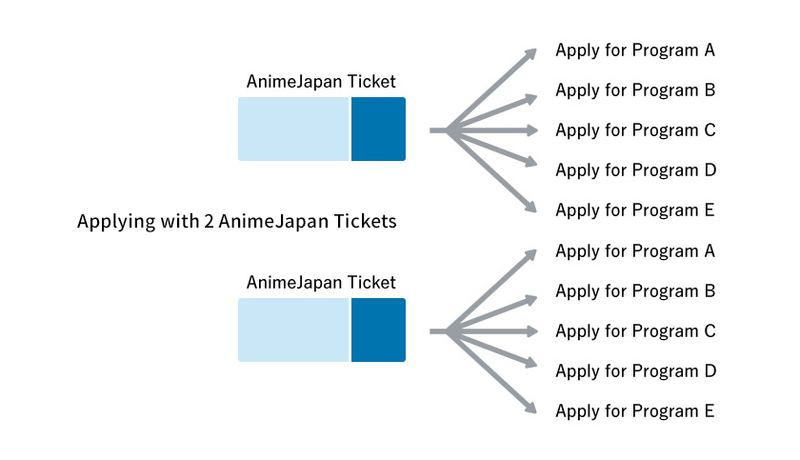 ※The same process applies when using 2 tickets at the same time for the pair tickets application. The seats for the pair tickets will be located next to each other. You can apply with 2 tickets for the same program. In that case both tickets will be treated as the same application and 2 tickets will be issued for the same program. You can apply only for the programs on the day of the ticket you purchased.